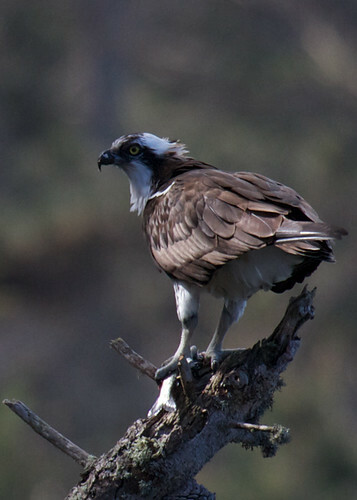 I have got to admit, that I am leaning towards the Osprey. It took me over a year of looking before I even saw it. And to catch it with lunch in hand (talon) was special. Please feel free to express your views in the comments. It is usually pretty hard to predict what you will see on a birding outing, unless you are going to the local pond looking for mallards. But sometimes the world works like clockwork and past performance does guarantee future results. Such is the case with the annual termite hatch. Every year, the first rain gets termites stirring in their underground chambers. After the rain passes and the ground warms, legions of termites with newly grown wings march up and take flight. Only to be eaten by the birds who have also been waiting for the day. This is a day to see wrens and warblers. Those little flits, you hear but never quite see, throw caution to the wind as they gobble up the termite hordes. 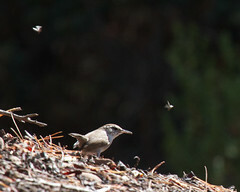 Bewick’s Wrens were out in force, grabbing termites off the ground and occasionally in the air. The Townsend’s Warblers were big on picking them out of the air. And while I tried, I was unable to catch a mid air grab. 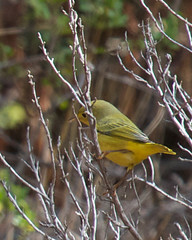 There was also an “new” warbler for me, the Yellow Warbler. 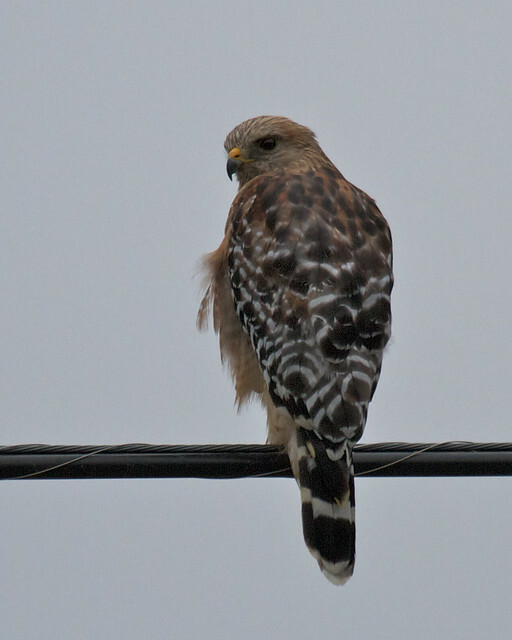 I think it fits into the category of birds that I have seen, but never noticed. Chickadees, juncos, and quail were also filling their gullets with termites. It was an easy day to be a bird. And as a result, an easy day to be a birder. There is nothing like a job to cut into your photography excursions. Not that I am complaining. After ten plus years of being self-employed, I am now working for someone else. It is a little different, but a regular income is better than an irregular one. It will take some getting used to. For example my old boss was extremely flexible with the hours that I kept, allowing me to go out birding and taking photos nearly whenever I wanted to. Anyway, I bring all of this up to explain why there hasn’t been a bird of the week or even a post here for the last month. I have been a little busy, applying for, interviewing for, and ultimately getting and starting a new job. 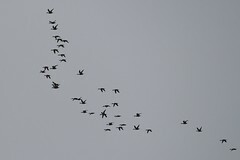 I did get out to Moss Landing last week and the waterfowl are still migrating through. 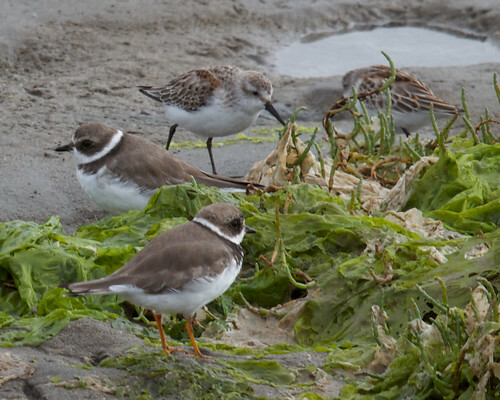 There are large flocks of peeps (tiny shorebirds) in the wetlands south of highway 1, where there is no place to stop and look at them safely. Is shooting at the feeder cheating? 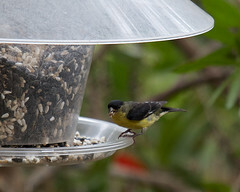 I have a feeder that I keep stocked with an assortment of seeds. It draws an assortment of birds, some that I don’t usually see in my typical bird photography adventures. If I shoot birds around the feeder, am I cheating? It is a valid question, because I try to capture birds in a reasonably natural setting, so having a plastic bin full of seeds defeats that. But feeders attract birds and that is what I am trying to shoot. And if I don’t get out on a birding trip? 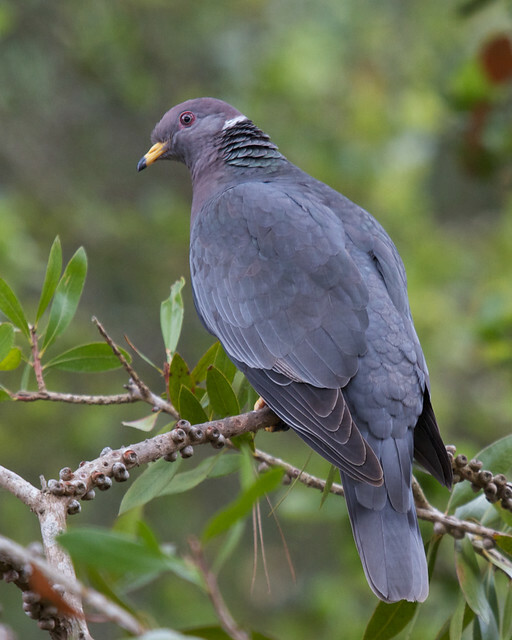 Well, it is time to confess, the Band-tailed Pigeon, was a feeder shot. While they are around, they don’t usually come in close enough to get a shot like that. Anyway, I will try to limit my feeder shots and in the future tell you when a shot was taken near the feeder. As difficult as last weeks selection was, this one was easy. 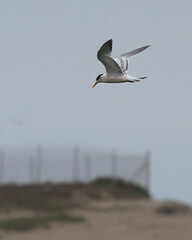 I went out to Moss Landing with hope of shooting some terns. Both Caspian and Forster’s Terns are in the area and I saw a number of Caspians in the distance when I was there last week. My hopes of getting a closer shot were dashed by construction which closed most of Moss Landing State Beach. So I had to shoot across the harbor to the jetty were the terns were hanging out. Fortunately, there were some Forster’s Terns in the air and I got a few shots. With the State Beach closed, I crossed the highway and checked out the Moss Landing Wildlife Area. The Wildlife area sits behind a boat repair shop. It is the sort of unpretentious setting that appeals to me. There is a viewing platform a little over 0.2 miles from the parking lot. Once there I spotted a Least Sandpiper, some Caspian Terns fishing out on the Slough and a large collection of young Brown Pelicans about a quarter of a mile away. Sometimes, you don’t get the shot, but the experience is what matters. Yesterday I was shooting at Kirby Park on Elkhorn Slough. Throughout the day I had been fighting focusing issues. When trying to focus on a distant object against the sky, the camera tries to focus on something close but nonexistent. Yes, I should switch to manual, but I am just not that fast anymore. Then I see two birds coming toward me. Hello, who are you, I look through the viewfinder and it goes from sharp to fuzzy. Less than a second later there is a swoosh, swoosh as two falcons pull up out of dives within fifteen feet of me. I think they were going for swallows. I watched them as they headed off across the tide flats hunting and diving as they went. It would have been a cool shot, but even my camera isn’t going to catch a falcon coming towards you that fast. 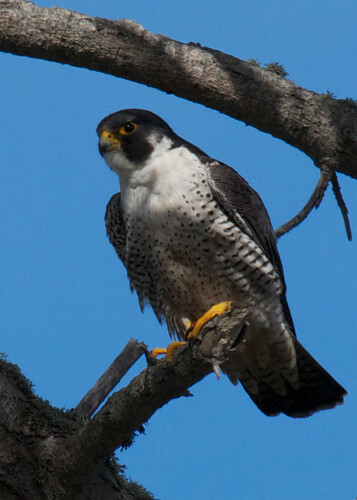 All I have is the experience of falcons flying so close and fast that you can hear the wind on their wings. There is nothing like giving yourself a deadline to insure a week of crappy shots. 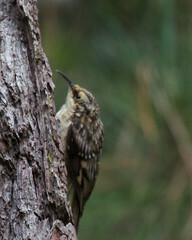 All I had to do was come up with a good bird shot by Sunday evening, and my “Bird of the Week” column could go forward. As of Saturday I had a fair shot of White Pelicans in flight and a below average shot of a Brown Creeper. Today’s trip to Andrew Molera State Park (for a Surfrider Foundation beach clean-up) didn’t help much. 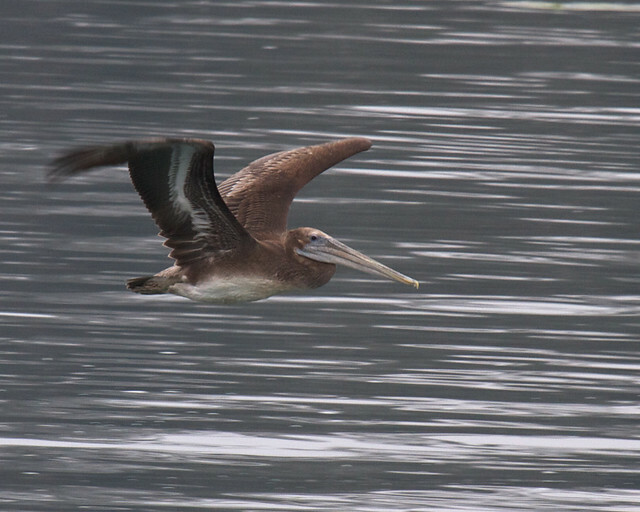 A fair number of Brown Pelicans and number of Wrentits that just managed to stay out of focus or out of sight. Ok, so this site is in its infancy and I am trying to figure out things I can do to keep it current and give you a reason to come back for a visit. Another way of putting it is to throw “ideas” out and see what sticks. So the latest idea is a “Bird of the Week” column, which covers the birds that I have shot in the last week along with a crowning of the “Bird of the Week” shot. I have no idea if this will stick. Anyway, last week I spent sometime pulling weeds at Point Lobos and led a condor expedition down the Big Sur coast. I also refilled the bird feeder and took some shots its visitors. So there were ample opportunities to capture a “Bird of the Week”. First, I went out to Point Lobos to pull invasive plants off Sand Hill. 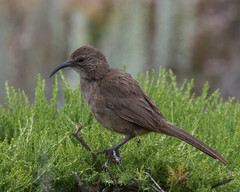 While there, a couple of California Thrashers got me to drop my trowel and pull out the camera. Both of them were timid, staying down in the brush. Finally one popped up and allowed me to get a few shots. Not my best Thrasher shot, but not bad. On Friday, I went with my sister and nephew down the Big Sur coast to see if we could spot some California Condors. 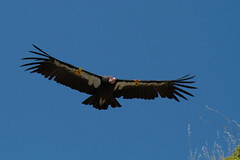 I have had a great deal of luck seeing condors since last November. On this trip, we spotted six condors, but only saw one reasonably close. 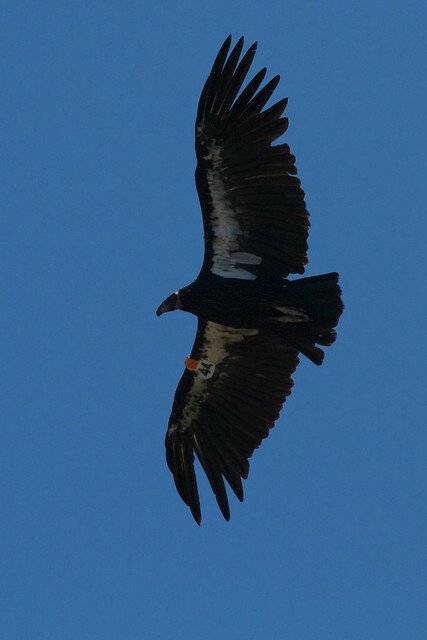 It turns out it was Big Sur Condor #4, who I have seen repeatedly in the last eight months. According to MyCondor.org he is a 12 year old male named “Amigo”. Finally, there has been a lot of activity at the bird feeder recently. 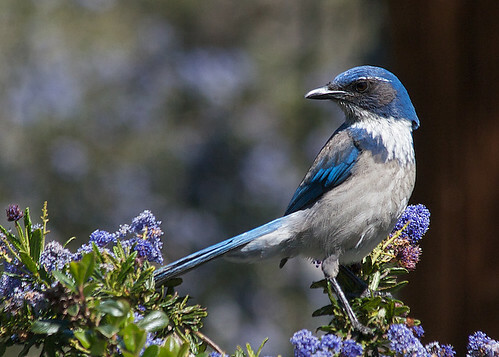 The usual assortment of Chestnut-backed Chickadees, House Finches, and Oak Titmouses, have been joined by Western Scrub-Jays and Stellar’s Jays. The jays are messy at the feeder and dump a lot of seeds on the ground. This last week Eurasian Collared-Doves and Band-tailed Pigeons decided that the Morning Doves had a good gig cleaning up seeds on the ground. I don’t usually see Band-taileds this close, so I got a few shots. Come back in next week to see if this idea sticks. There was a reason I bought my truck nearly 20 years ago and when I needed to make some end of life decisions last year, sunk my savings into it to keep it running. It takes me where I want to go. Sometimes, that is just a line on a map. Today it took me on the old coast road, east of Big Sur. Just a line on a map, but one I have been looking at it for a while. When the time came, the truck made the turn more than I did (I should probably get that looked at). 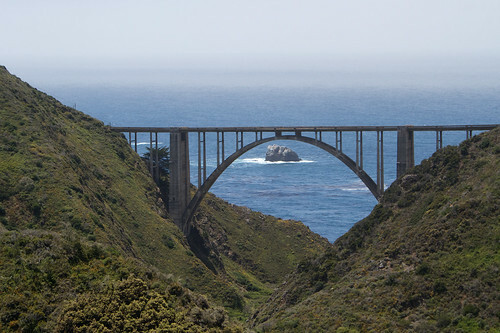 We spent the next hour driving over rocky passes and down through redwood filled canyons and ended up with a view of Bixby Creek bridge that you won’t see in a coffee table book. It was, time well spent. 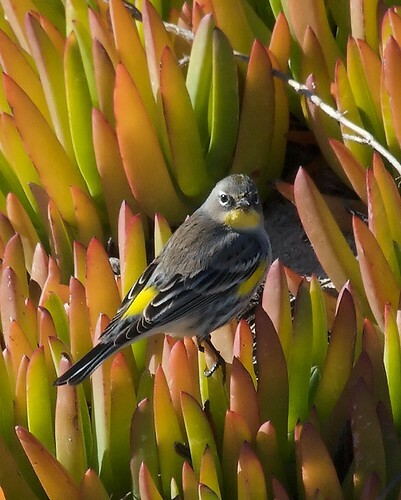 I am pleased to announce that the Wild Bird Haven of Monterey is offering six of my bird photos for sale. The 8×10 prints are signed, matted, and available for $55. If you are in Monterey, check them out. They are located in the Del Monte Center, next to Whole Foods.